On an early evening drive in the middle of November in 1996, I was sitting quietly in the back seat of my parent’s rental car traveling on Colorado’s Highway 36 when just after climbing over a ridge time suddenly stopped, my stomach dropped, and my eyes welled up with knowing tears, I was in love. 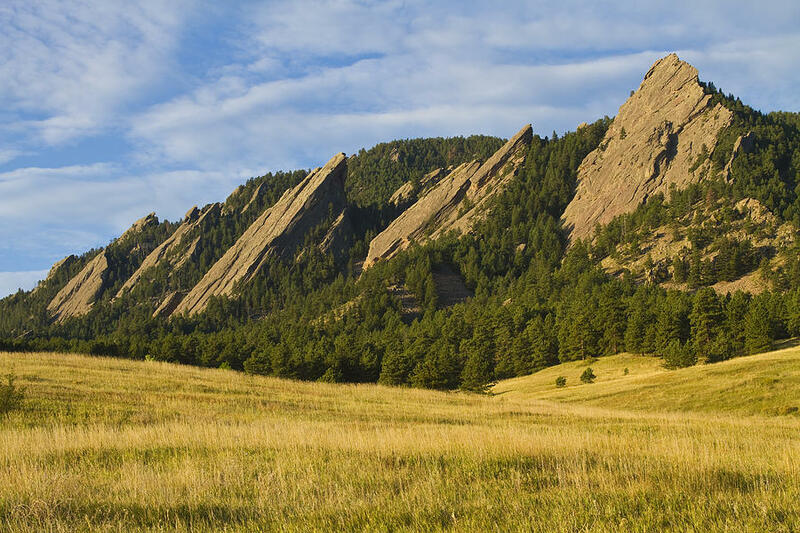 The Flatirons, Boulder's signature mountain range. We were on a college tour making our way north from Colorado Springs after spending all day visiting Colorado College and the Air Force Academy, my top two picks. (Full transparency, the Air Force Academy was a pipe dream, but my parents humored me and stopped by the campus anyway.) Next up on Taryn’s Rocky Mountain Potential Higher Education Tour was the University of Colorado at Boulder, and finally Colorado State University in Fort Collins. I made it clear before we left LA that I had no interest in attending a big school like CU or CSU, but my older brother Chris went to CU and loved it, and another family friend raved about her time at CSU, so I agreed to add them to the roster. However, when I saw the Flat Irons that first time, I knew the search was over. CU Boulder not only became my first choice, but my only choice. (According to my melodramatic seventeen-year-old self, anyway). I don’t think I said one word to my parents while we drove around the campus and wound our way downtown to Pearl St. for dinner. I was in shock. The beautiful brick buildings adorning the campus were not at all what I expected. They were warm, inviting, not dominating or sterile like I assumed; my prejudice of a larger campus was unfounded. I felt at home. We shared a magical meal that night at the Restaurant, Q’s, which was nestled on the second floor of the historical Hotel Boulderado. The restaurant became an instant favorite, and would serve as a venue we would dine at for a handful of special occasions over the next four years. (I also worked in their kitchen for one day, but that is a story for another day). 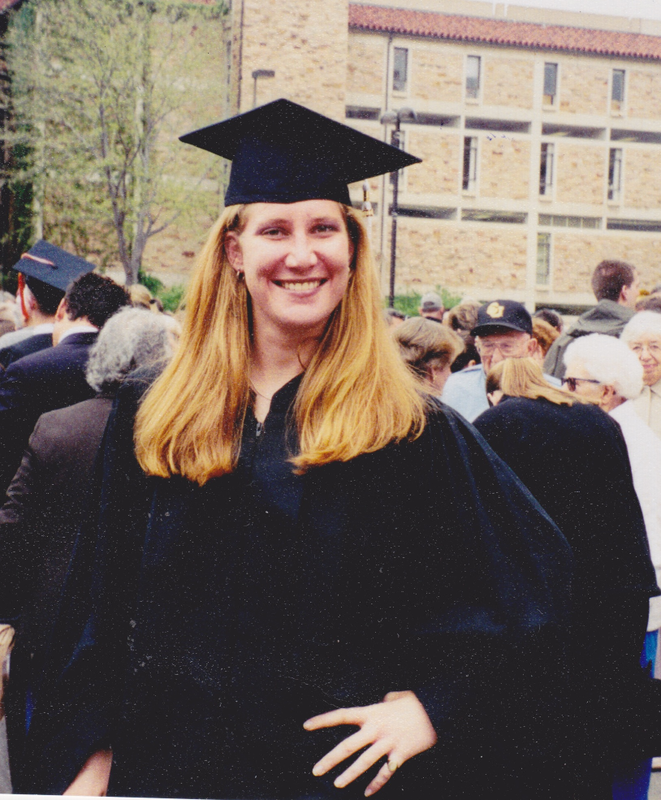 Yep, on March 29th, 1997 I received the fat package I had been obsessing over for months, my acceptance letter to the University of Colorado at Boulder. The following string of words is the biggest understatement of the century; I had a good time in college. A gaggle of my favorites ladies on the planet, Annie Fabik, Susie Wood, Hillary Jackson, and Rebecca Sundell. 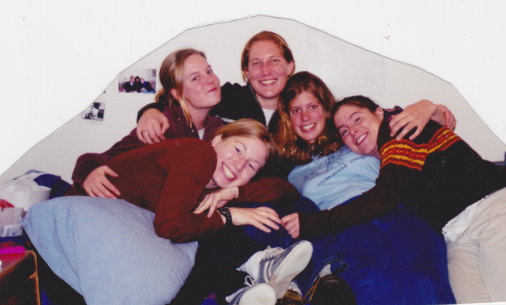 I made cherished friends in my freshman dorm, LIBBY PIT, learned how to think, feel, and ponder life from my fantastic professors, shaped young lives as a Resident Advisor, AND trained for my first marathon on the roads and paths surrounding and running through Boulder my senior year. That last part is when things really got interesting. “Taryn, you only have, like, four months until the race; you really need to start training!” My friend, roommate, and marathon role model, Hillary Jackson, bellowed out in my direction across our living room one late Saturday morning in February, 2001. It was snowing, I was hung over, my favorite Denny’s dish, Moons Over My Hammy, was still digesting, but I heard what she said. Reality finally sunk in. I had my first marathon rapidly approaching in early June, and had only scratched the surface of the training I needed to complete just be ready to survive the day, let alone run well. Over the next four months I ran in sleet, snow, heavy winds, and rain, (an average Spring in Colorado), in order to accomplish all of the training on my First Time Marathoner schedule, and showed up to the starting line in San Diego on June 3rd prepped to run 26.2 miles. 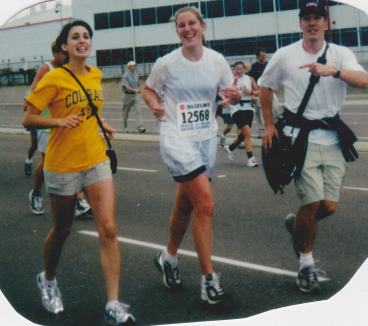 June 3rd, 2001, Flanked by my friend and roommate Sarah Gonzalez and my brother, Peter, at my first marathon, The Rock N' Roll in San Diego. It also turned out to be the most transformative day of my life. I have been back to Boulder a few times since I graduated in 2001, the most meaningful occasion was to celebrate the lady who started all of the marathon madness for me, my friend Hillary’s wedding in 2011. In less than six weeks, on June 10th, I will be back again to race in the Ironman, which means I will be running my 49th marathon on the roads I trained on for my first. How cool is that??! I have grown up a bit since the last time I ran the roads around the Boulder Res, and ran up and down Boulder Creek. I achieved a career within my college major, (Film Studies), I’ve been married for nearly a dozen years, helped raise an incredible human being who is in the midst of her own higher education adventure, written a book, and competed in more than my fair share of marathons and iron distance triathlons. But it all started in Boulder. My friend's Susie Wood and Chanda Grizzell moments before went to go see the movie, "Charlie's Angels." Obviously, this Ironman will be very sentimental. It will also be very challenging. I have never performed well in altitude, either when acclimated to it, or not. I never adjusted to the mile high elevation in Albuquerque during my big running Summer in 2015, Boulder is about the same elevation. And I will be coming from sea level just a few days before the race, which should be fun, but I enjoy a challenge. What are we here for? The next six weeks of training will be tough, which in turn translates to entertaining content for all of you. I hope. I may miss a few words here or there due to exhaustion, my apologies in advance, but I live for this grueling part of the process, and look forward to sharing all, or most of it. Titanica is ready to go back to Boulder! My GLOW alter ego, Titanica. "Your heart won't go on." By the way, I never got out of the car in Fort Collins. Following is the new tune from my girl, Halsey, "Alone", featuring Big Sean and Stefflon Don.